The attention of this horse is caught by something on the right, which makes that the horse also looks at the spectator. In this way a lively scene has been created by the sculptor. The rider controls his horse without hampering its natural behavior.He sits almost on the croupe of the horse, which is the logical position when riding without saddle and stirrups. 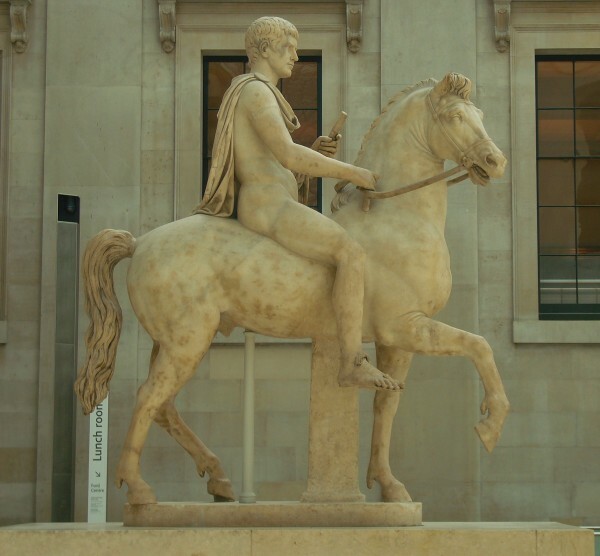 The horse is a beautiful example of a well-bred Roman horse, maybe somewhat idealized. The rider could be a member of an important family, the Julio-Claudian dynasty. The condition of this marble statue is remarkably good, thanks to the restoration in the 16th century by Giacomo della Porta. Altogether we see a well-balanced combination of horse and rider with only a snaffle and no other mechanical aids from 2000 years ago.